The group was formed by Roy Crain, who had launched his first quartet, which sang in a jubilee style, in 1926 in Trinity, Texas. In the early 1930s, after Crain moved to Houston, he joined an existing group on the condition that it change its name to "the Soul Stirrers." 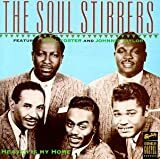 The name "Soul Stirrers" yields from the description of one of Roy Crain's earlier quartets as "soul-stirring". Among the members of that group was R. (Rebert) H. Harris, who soon became its musical leader. The Soul Stirrers formed as a Jubilee quartet, transformed their sound, influenced by many hard gospel singers such as Mahalia Jackson and Sister Rosetta Tharpe. Rebert Harris, also from Trinity, Texas, brought several changes to the Soul Stirrers that affected gospel quartet singing generally. He used a falsetto style that had its antecedents in African music, but which was new to the popular jubilee singing style of the time. He pioneered the "swing lead", in which two singers would share the job of leading the song, allowing virtuoso singers to increase the emotional intensity of the song as the lead passed between them without disturbing the four part harmony. That innovation led the Soul Stirrers, while still called a quartet, to acquire five members. In 1936, Alan Lomax recorded the Soul Stirrers for the Library of Congress's American music project, and those four unissued recordings are in the American Folklife Center collection today. They later moved to Chicago, where they broadcast a weekly radio show (WIND) with other famous groups including Golden Gate Quartet, and The Famous Blue Jay Singers. As the gospel quartet style of singing became more popular, groups would perform in competitions called "song battles" to further increase the genre's popularity. As World War II began, it became more difficult for many gospel quartet groups to make a living. This resulted in some quartets supplementing their income by doing "live performances at churches, schools and neighborhood centers," (Rubin). Despite the economic situation, throughout the 1940s and leading into the 1950s, many gospel quartet groups were able to pursue their careers successfully. The Soul Stirrer's nationwide touring gained them an even larger audience. The Soul Stirrers signed with Specialty Records, where they recorded a number of tracks, including "By and By" and "In that Awful Hour". Harris quit in late 1950 to form a new group, citing dissatisfaction with what he viewed as the crookedness of the business and immoral behaviour by musicians he saw on the "Gospel Highway" touring circuit. He was briefly replaced on lead by Paul Foster, then by Sam Cooke. Cooke joined the group at the age of nineteen served as lead vocalist from 1950 to 1956. One of the early singles with Cooke was "Jesus Gave Me Water", a major hit that brought the Soul Stirrers acclaim. Thomas L. Breuster was replaced by Bob King and, briefly, Julius Cheeks. When Cooke left in 1957 to pursue a career in pop music, the Soul Stirrers' preeminence in gospel was essentially over, though a brief period of success with Johnnie Taylor sustained the group for a time. Various line-ups continued touring and recording throughout the last half of the century to a small and devoted following. The group — and all of its members — was inducted into the Rock and Roll Hall of Fame in 1989 as one of rock's Early Influences, and into the Vocal Group Hall of Fame in 2000.